2011 Abdu had arrived at SHALOM. He was the youngest and sooo cute. All we knew was he had been brought by one of the previous carers, whom we met in 2010 but was no longer there – her name was Josephine. He appeared to be a ‘pure’ orphan. No one seemed to have any information about this small boy, where he was from or knowledge of any family but my first engagement with him was in 2012. There was this sweet boy crying in the distance and I was compelled to approach him. He had fallen over and was nursing a graze. I popped him on my knees, gave him a cuddle (which he just sank into) and pulled out the first aid kit to band-aid his knee. This brought on a steady procession of boys with scabs and sores seeking some medication relief. I felt it was more the attention of a mother they seemed to yearn. 2012 Abdu was one of 16 boys who moved to a rural orphanage. Unfortunately, the next 2 years he became spoiled by the orphanage leaders. Abdu had become a favourite of around 60 students and was rewarded with good food for telling tales on the students in the dorms, coupled with being one of the youngest and cutest, he didn’t stand a chance! 2014 It was time to move our students into a more constructive environment. The organisation running the orphanage had promised they would do everything to find parents for our students, but it was just talk. It was then I realised they were more interested in the money we were sending than finding families, since that would mean their commodity was no longer useful. Our next step was to find the now renamed ‘Joseph Mary’s’ family, which incidentally, renaming was his decision due to a love of the orphanage. In the new environment (a boarding school) Joseph Mary displayed terrible examples of lack of discipline. His now bullying behaviour and fighting meant we were in meetings looking for the best option for Joseph Mary, now 8yrs old. It became clear we needed to find his family. Fortunately, I had just reconnected with one of the original carers we found in 2010. I asked her about ‘Abdu’ but she had no information. However, Hilda felt she may be able to find Josephine who brought Abdu to SHALOM. About 6 months passed before we could get any traction. 2015 Finally Joseph Mary was asked to find another school as he was not responding to the schools disciplinary measures. For around 5 years we had been working quietly with a very simple and yet honest Primary Boarding school near Entebbe. This was where we took Joseph Mary, although it was some distance away. With a male Headmaster and a fellow SHALOM ‘brother’ in Yr7 (our Yr6), Joseph Mary began to thrive once again. But we knew he needed family. 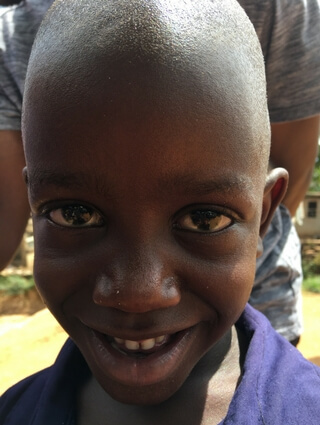 He was a true orphan or so we thought …about 2 years ago I received a random friend request from one of the original staff (Hilda) and around the same time I had heard it was another staff member by the name of Josephine who had bought Abdu to Shalom. After several emails, I found the carer Josephine and she knew all about his family. We couldn’t believe it. When I learnt he did have a family, I was shocked. Why for 5 years had Joseph Mary been with us? Why didn’t the family try and find him? How could a mother and father just leave their child for someone else to look after and even a muzungu that they don’t know? What sort of people must they be? What I was to learn was …the family feared that if they contacted me I would send Abdu back to them and this would ruin his chances of education and a better life than they could offer. I felt so bad for them. Years had been wasted just because they didn’t believe I would continue to help their son. It really is a difficult life for many, when I think of us trying to make those life changing decisions –I honestly don’t know what I would do? This was a whole new experience for me. Josephine contacted the family and luckily they were happy to meet with me – hesitant but happy. Mum Gertrude & dad Siraj, showed nothing but smiles of love when I showed them a photograph of Abdu (Joseph Mary). His little brothers, and an older sister crowded around me. There were tears and stories shared. All the children were not in school. Abdu had been the only one to get out of the slum and a situation where food was irregular and money scarce. The home was a rented house joined on both sides of just one room, one window and one door. All 6 lived in the small room, while 2 older siblings were in the village staying with a grandmother. Joseph Mary would be the 7th if he returned home. Dad can’t find work and mum does some small selling at the markets, if she can find goods to sell. The family was excited to be reunited and Joseph Mary was hesitant, but under the supervision of Josephine, who was now a trained Social Worker, he has been reunited with his family. 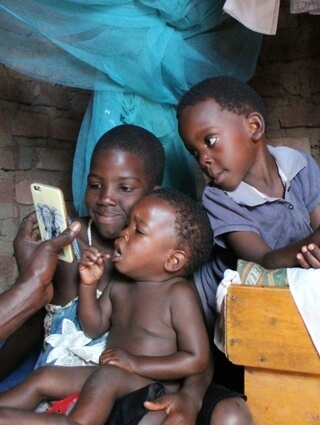 We have taken up sponsoring Joseph Mary’s siblings Hassan 6yrs, Husein 5yrs and Joweria 12yrs. The family still has many struggles, as the parents have never had the privilege of education, and continue to live a life of struggle and disempowerment. We hope the future is different for them, as some of their children become educated and empowered. These children are our hope and our future.